My quick weekend trip back to Missouri was lots of fun. It didn’t allow nearly enough time to me to see a lot of people but I’ve already decided to make another return trip, sometime in the Spring and maybe I’ll take the kiddos with me. 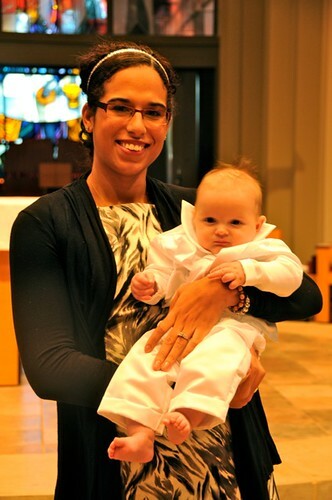 The reason I headed back was to attend the baptism of my Godson, and here I am with one of the newest members of the Catholic Church. It’s a little over a week until Christmas. Guess who still has not found a gift for her husband. Yup. Me. The Bear has been pretty clear about wanting a Play-Dough Ice Cream maker and a Barbie “Beetle” for Christmas. She has become enthralled by Beetle cars… whenever we run errands, she keeps a running tally of Beetles. I wonder if I can find a toy Beetle that has not been branded by Mattel? 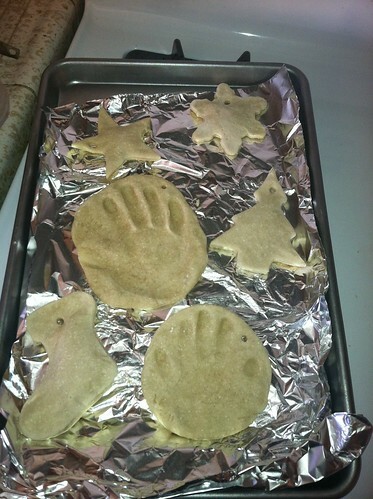 Yesterday, using some Pinterest-piration, the kiddos and I made Salt Dough Ornaments. I used my KitchenAid mixer to knead the dough together but forgot to prick the ornaments before baking, so some kind of puffed up, but they look pretty neat. We are going to paint them today. You can find the original post, with directions, here. Yesterday, I started detoxing from sugar. You might think it’s extreme to call it a detox, but that it totally what it is. And yesterday was horrid! I let the girls have a TV day as I just felt ill all day: Headache, shaking, nausea, tired. Today is Day 2 and I am feeling much better. I am not as trembly and my head is not as achy, but not 100%. I am following the cleanse guidelines from here. I know that it’s crazy to start this right in the middle of the gluttonous season known as the holidays, but I like a challenge. Plus, I am really tired of people asking when the baby is due. I. am. not. pregnant. I just look 6 months along because I am perm-bloated and stoppered up. TMI, I know. Thank you so much for all of your prayers, positive thoughts, cards and gifts! It really did brighten my life in this dark moment. It’s so hard being away from friends and not having a support system (yet!) and it’s great knowing that you are all there! Be sure to head over to Conversion Diary to read more Seven Quick Takes! I got a Kitchenaid last year for Christmas and I LOVE IT!! Idk how I lived without it! The only bad thing was last year we used it to knead the dough and flatten the dough for our raviolis and it got overheated half way through 😦 so I think we won’t be using it to knead the dough this year. Hope your detox goes well and hope you get to enjoy at least some of Christmas dinner with it! I hadn’t seen my family in many months when we got together last week and my mother crept up to me just after I got in the door, stage-whispering, “Are you PREGNANT?!! !” (Yeah, Mom, like I’d be pregnant enough to look it but not have told you….) Anyway I just started saying, “Hi! Long time no see! BTW, not pregnant– just fat!” to all the friends and fam I encountered that day. Anyway, ugh. I know I need a sugar detox and I know I am an addict. So I have a feeling I will have a week of withdrawal. I am not strong enough to start now. So, God bless you for doing it now, and just know there are great rewards to it, not just weight but overall feelings of well-being and balance.